What Impact will Kindle Library Lending Have on E-book Sales? If you follow the e-book publisher news, you might have seen some mention of the major publisher Penguin Group’s decision to take away, then restore their titles to OverDrive. 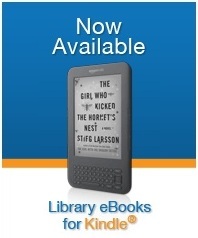 OverDrive is used by many libraries to deliver e-books to their patrons. States including North Carolina have a digital library that is run through OverDrive, and it is the place where patrons have to go to download books for all e-readers, tablets, and smartphones. A couple of months ago, Amazon began offering Kindle e-books to 11,000 and counting libraries nationwide through a partnership with OverDrive. The service is extremely popular with library patrons, and there are already long waiting lists for popular titles. Penguin will restore their titles at least until the end of 2011, and is working with OverDrive to write up some regulations that will fit their needs. Does this whole issue mean that publishers are starting to freak out about whether allowing library lending will impact their e-book sales? Probably. But at the same time, it is also adding libraries to their consumer list. Libraries have to purchase copies of the e-books just like they do regular ones. I wonder if there was a big fight with the publishers when libraries started buying books way back when? I think that the bigger thing that is hurting e-book sales overall is the higher prices. Kindle e-book prices have gone as high as $16.99, which no one could reconcile paying that for an e-book unless there is no other cheaper option. The good news is that there are plenty of Kindle e-books out there that are free or reduced price. Most of them are older ones, or ones written by self published authors. On another thought, in the past, library patrons have checked out newly released books at the library, and then purchased them later if they really liked them. The same idea will most likely go for e-books. I can understand the fear that books might end up like music once did with the rise of Napster and other music sharing sites. I can also understand that it is important to make everything secure so no one gets misled. But, I think that it is important to keep the consumers in mind because they are the ones who are reading the books. It will be interesting to see what other major publishers such as HarperCollins and Random House do as Kindle library lending becomes more popular. 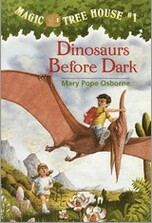 As of today, 6/16/2010, Random House’s Magic Tree House series, a childrens’ staple since 1992 by Mary Pope Osborne has been released for the Kindle. All 43 books in the amazingly popular series are now up for sale in the Kindle Store as I write this, with the 44th already available for preorder, anticipating its September 14th release. The Magic Tree House series has sold over 70 million copies worldwide, been translated into 28 languages, and distributed in 31 countries over the course of its life cycle so far. It is a widely acknowledged tool in promoting childrens’ literacy and can be(and often is) coupled with Random House-distributed educational material related to the stories for use in classrooms as a teaching aid in any number of subjects. Much publicity has focused on what the Kindle can do on college and high school campuses, but this brings useful attention to the fact that an eReader with a properly durable case, perhaps even a library’s worth of them, could easily enhance the learning experiences of children at any age. The Text-to-Speech feature is helpful for any struggling reader and the ability to vary the font size can make a text more approachable for easily overwhelmed young readers still unsure of their ability. Clearly a step in the right direction. All of these books are ranked pretty high in the Kindle store now. And although I have plenty of books lined up for reading right now, I will download these while they are free and before I forget so I can read them some time later.